Free Printable August 2016 Calendar. Get the Printable August 2016 Calendar Free. Good for planning at the college, university, school, home, classroom, small business or work place. All the calendars includes previous and next month. Choose from 2 options, calendar starting the week on Monday or Sunday with holidays. 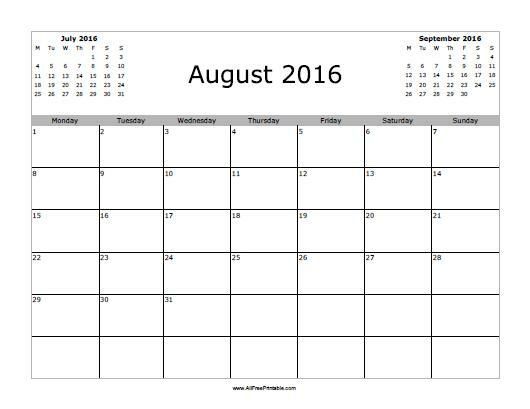 Use the free printable August 2016 calendar to write down important events like first day of school, due dates, job interview, insurance, restaurant dinner, beauty salon appointment, job schedule, things to do at home and more. Click the link of your choice to download or print now.